This strategy places buy and sell buttons on your chart, per the below image. Sometimes you just want to stab the Buy or Sell button, don’t you? I don’t have space nor want a DOM running for everything. The inbuilt ‘CharTrader’ (as shown below) wastes soooo much chart space. My version is more space efficient, for me, at least. I don’t want a 3rd of my chart space filled with the empty space the CharTrader sidebar uses. This is an early ALPHA. I built it to see if I find it useful and to get some ideas of what to build for production. It is in no way intended for use on LIVE accounts! You heard me. Any losses incurred during it’s use are entirely your own. In order to access Ninjatrader’s order management, this app needs to be installed as a strategy on the chart and not as an indicator. Right click your chart, go to strategies, install it and make sure you ‘Enable’ it. The avg price reported is the price Ninjatrader calculates. If you scalp in and out maintaining a position, it is useless. I will probably change this to add a proper theoretical average, maybe even plot a BE line and risk management. It currently places market orders only. This is likely fine on ES etc, but beware if trading thin, widely spread instruments. Think you can swing trade? Make a game of it. 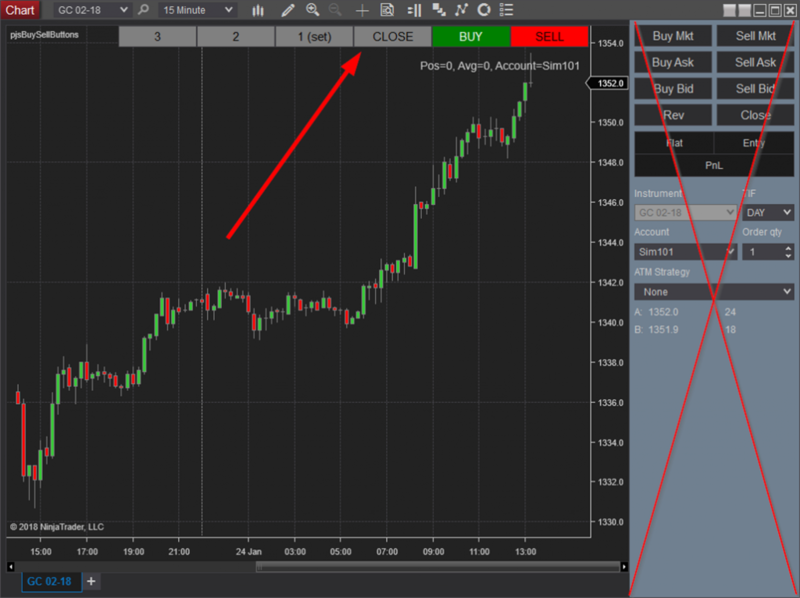 If you have replay data, load up your chart, add your favourite indicators, add the buttons to the chart, turn on market replay, turn up the speed and stab away. When you finally get bored, go look at the trade statistics and see if you made any money. This is a surprisingly entertaining and revealing exercise, especially on long term charts/trends.